Amazon is launching the new gadget again, this time is Fire TV Stick. You can get it ship to Singapore via forwarder, it is now open for pre-order. Amazon Fire TV is priced at $39, but during the first two days of launch, Amazon Prime member can get it for just $19. Click here to see the latest price. By the way, anyone can signup the Amazon Prime free trial to enjoy the special price too. Amazon launched the Fire TV set-top box early this year price at USD$99 while Google released Chromecast last year at only USD$35, which attracts many consumers because of its “value for money”. Now Google is unveiling its $99 Nexus player and meanwhile, Amazon releases a USB streaming dongle, the Fire TV Stick to counter fight. 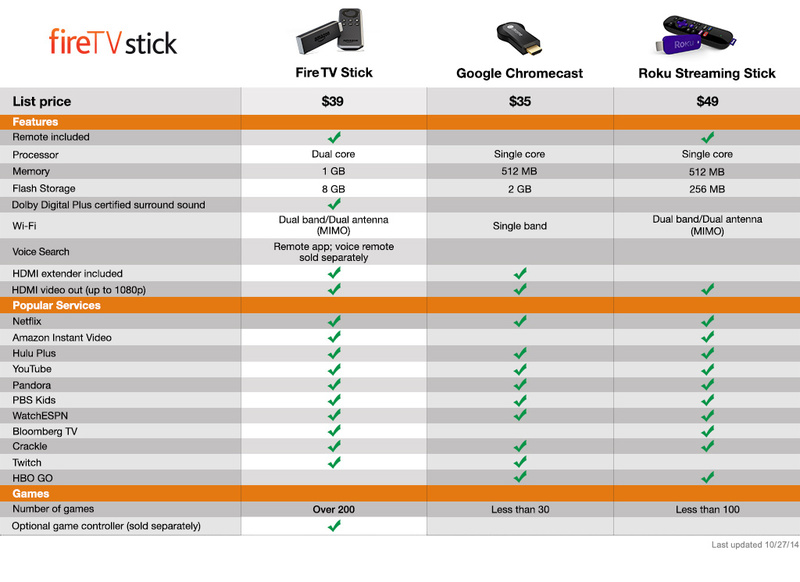 Amazon Fire TV Stick is directly competing with Google Chromecast, there is a comparison chart to compare FireTV Stick vs. Google Chromecast vs. Roku Streaming Stick. Click here to see. Amazon Fire TV Stick is just like the Fire TV set-top, it allows you to connects your HDTV online to enjoy a wide selection of movies and TV episodes, you can play games, listen to the music, view photos directly from the Amazon Cloud Storage and more. You don't have to be a Prime member to use this device, Fire TV Stick is surely a convenient way to enjoy both paid and free channels like Netflix, Amazon Instant Video, Hulu Plus, Crackle, Amazon Music, iHeart Radio, Spotify, Watch ESPN, Pandora, Smithsonian Channel, Flixter, Vimeo, Youtube, A&E, PBS Kids, Bloombeg, Huffpost Live, Twitch, NBA Game Time, History Channel, Showtime Anytime, Plex, Vevo and many more. 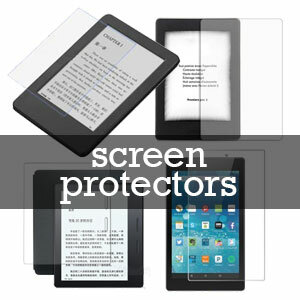 If you are an Amazon Prime member, you will get instant access to a massive selection of Free TV episodes, movies and songs. Fire TV is running on dual-core processor, 1 GB of RAM, and 8 GB of internal storage. Which is 4 times bigger storage and twice the amount of RAM that Chromecast has. 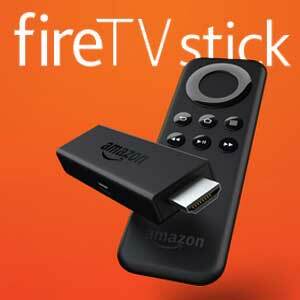 You can view the Fire TV Stick full specification here. The Fire TV Stick has more features than Chromecast, it is running on its own user interface just like the Fire TV, you can mirror the screen of Kindle Fire, Amazon Fire Phone or other devices that support Miracast to your TV via Fire TV Stick. The stick is packed with its own remote controller, so you don't need to depend on controller app. There is also an optional voice controller that you can buy separately. The voice controller will enable the Fire TV Stick for voice search, exactly like what the Amazon Fire TV offered. The tiny size of Fire TV make it so portable that you can just put it in your pocket and bring it anyway, and just plug onto any HDTV when you want to use it. Of course, if you want to use Fire TV Stick in Singapore for watching geographical restricted video like Netflix, Amazon Prime Video, then you will need to at least have the smart DNS configuration. You can read here for more information about smart DNS for Fire TV. The Fire TV Stick is available for pre-order now for $39.99, and it will start shipping on 19 November, due to the popular demand, the shipping date might just be pushed to the later date depends on how early you place the order. Amazon does not support direct shipping of Fire TV Stick to Singapore, so you will need to go through package forwarder service, read here for more information on how to use package forwarder service. Get Amazon Fire TV Stick here!